Yes! 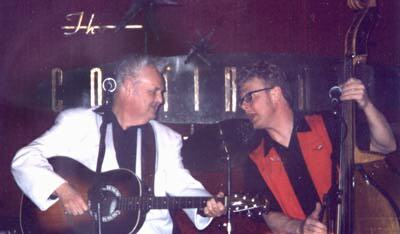 Veteran Rockabilly Pioneer Billy Adams is about to release a 14 song authentically recorded and produced CD. Recorded exclusively at Wild Hare studios (Berkeley Springs, WV) as well as the new 35th State Recording Studio (Clarksburg, WV). This CD entitled "Billy Adams' Wild Rhythm" showcases Billy's most impressive recording work to date. A veteran song writer, instrumentalist, vocalist and performer; Billy is in his 60th year of performing. And he is not done yet. Plans are being made now for select appearances throughout the US and Europe beginning in the summer of 2013 and beyond. Be sure to see Billy at one his shows, hear him on radio or read about him in trade magazines as momentum is building for a run of great performances and appearances. Billy Adams is best known for his 1955 Quincy Records gem "Rock Pretty Mama". 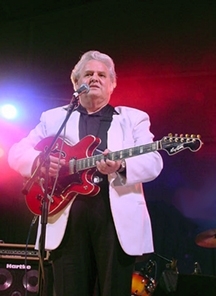 Billy is considered to be one of the original rockabilly pioneers and certainly the most prominent/important Kentucky Rockabilly artist in Rock 'n' Roll history. NASHVILLE, TN. (October 9, 2007) - Rockabilly pioneer, and gospel music artist, Billy Adams, is celebrating his 50th anniversary as a recording artist. His signature song, "Rock, Pretty Mama," was released on Quincy Records, in November 1957. In the month of October, Adams will be featured in the Public Radio International (PRI) series, Whole Lotta Shakin'. The series comprises ten one-hour documentaries that explore the artists and artistry of rockabilly - the foundation of rock and roll. Adams is the first voice heard in the "teaser" at the beginning of every show, along with Barbara Pittman, Carl Perkins, Janis Martin and Eddie Cochran. He is quoted in the series opener, "Good Rockin' Tonight," and his story is told in the fourth installment, "Rebels with Guitars." Also in October, Adams will fulfill a lifelong dream when he and his band, The Rock-A-Teers, will perform in the Rotunda of the Country Music Hall of Fame and Museum, at "Rhythm of the Road," the 12th Annual International Adopt-A-Highway Association Conference, on October 25. The concert will also feature the reunion of Mountain Harmony, a vocal trio comprised of his three daughters, Tina, Janetta Darlene, and Teresa. Adams has already gotten a good jump start on his anniversary festivities. He recently returned to England for a third time where he performed two successful shows at the Americana International Festival, in Newark, Europe's largest "American lifestyle" music and cultural event. Adams delivered the goods to his rockabilly and rock 'n' roll fans during the first show, and it was a proud moment for him he introduced daughter, Janetta Darlene to his European fans, who welcomed her with open arms. For his gospel show, Adams had the crowd singing along with him when he and his group performed as special guests on George Hamilton IV's annual Sunday morning concert. In the late-50's, Adams released a series of rockabilly and rock 'n' roll recordings on Quincy, Dot and Nau-Voo Records. Including "Rock, Pretty Mama," his best-known recordings from that era include, "You Heard Me Knocking," "You Gotta Have A Duck Tail," and "Return Of The All American Boy." In the early 60's, Adams received his calling into the ministry, where he concentrated his efforts on writing and recording gospel music. In addition to dozens of single and album releases of his own, Adams' material has been recorded by numerous artists, including The Happy Goodman Family, who took his song, "I Saw The Man" to the top of the gospel charts in 1974. Until recently, Adams' contributions to early rockabilly and rock 'n' roll had been overlooked - and due to a mix-up with another artist by the same name, he was believed to be deceased. Adams put those rumors to rest when he released his 2000 rockabilly "comeback" record, Legacy. With that, music scholars and fans from Europe and the U.S. began to rediscover his early music. In 2002, he was the focus of a career retrospective, Rockin' Thru The Years, issued on Sanctuary Records. Since then, he has been featured on several major label compilations, alongside legendary figures such as Elvis, Roy Orbison, Jerry Lee Lewis and others. Musicologist Colin Escott summed Adams up best in the liner notes of Rockabilly Riot: "He is now one of the great exponents of rockabilly from the golden era." Adams also continues to spread his ministry; he currently pastors The Word Church of God in Lewisburg, TN, and he was recently ordained as a Bishop. May 14, 2007 -- Freda Adams, wife of rockabilly pioneer, and gospel music recording artist, Billy Adams, passed away on Friday, May 11, 2007 after a long battle with uterine cancer. Freda Louise Riffe and Willie Murray "Billy"Adams were married in Flatwoods, Ky., on July 9, 1961. For the last 46 years, the two shared an inspiring and romantic fairy-tale love story. Three daughters were born to the union; Tina Maria, Teresa Louise, and Janetta Darlene.�Mrs. Adams�was a devoted wife and mother who loved cooking and caring for her family. She also enjoyed crocheting, reading, and working crossword puzzles. After her husband gave his heart to the Lord in 1965,�she worked tirelessly for the remainder of her life to support his ministry. Together they founded and revived many churches across Kentucky and Tennessee. As their ministry grew, the family formed a musical group, which featured Freda on piano and organ, and they spent many years traveling across the United States to help spread the word of God. Billy Adams, still an active writer and performer,�is best known for his 1957 rockabilly classic, "Rock, Pretty Mama,"and his gospel song, "I Saw The Man,"both of which he wrote and recorded. The latter was also a chart-topper for The Happy Goodman Family in 1974. 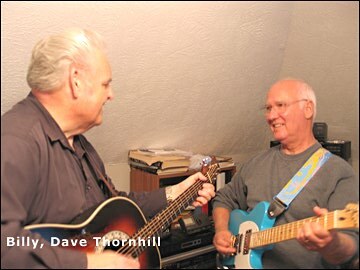 Billy Adams reunited with his old friend, and former band mate, Dave Thornhill, on October 29, 2005. Thornhill was a member of the Rock-A-Teers, Adams' pioneering rock 'n' roll outfit from the 1950s. The two jammed together and played songs from their early days for the first time in over forty-five years (in the ensuing years, Thornhill was the guitar player for country music icon, Loretta Lynn, and he appeared in the film, "A Coal Miner's Daughter"). They were joined by music veterans Dennis Digby on upright bass (he played and recorded for many years with the Osbourne Brothers and Mel Tillis, among others), and Adams' longtime drummer, Clif Doyal. The four pickers jammed for several hours on songs from Adams' early career, including "Rock, Pretty Mama," "You Heard Me Knocking," and "You Gotta Have A Duck Tail." They also played songs "from the day" that had been part of the Rock-A-Teers setlist in the 50s, along with tunes from Elvis, and several country songs. 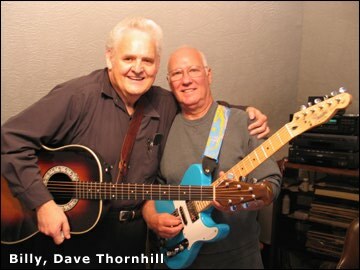 As Adams and Thornhill reminisced about their early musical experiences, the years melted away between the days of their youth as young barnstorming rebel-rousers, and the older-and-a-bit-wiser men that they are today. At one point, Thornhill said about those times: "It seems like just a few days ago in some ways, and in other ways, it seems like it was an eternity ago." Thornhill also set the record straight on how the Rock-A-Teers grew from being a trio most of the time to becoming a big band. "Billy, Charlie (Adams), Curt May, and Randy McKinney were playing at one bar in Portsmouth, Ohio, and me and my brother, John, Bobby Lawson and Ken Riley were playing at the other. We were all friends. Most of us went into the Nau-Voo studio with Billy to record "Duck Tail," and when the song started getting airplay, Billy started getting calls to do concerts. He decided that we should all team up part of the time for these larger shows. You know-so we could have a bigger sound." He also adds, "We were the first band to use two upright bass players." As the day wound down, the two old friends talked about future plans and agreed to get back together to "see what might happen." "Rip Van Winkle," a novelty song performed by Billy Adams and released on Fern Records in 1961, has "reawakened," and is gaining new popularity in England. Fans have reported hearing the song on the radio there, and recent royalty statements from BMI bear out this fact. As the name indicates, "Rip Van Winkle" is a takeoff on the age-old tale of a sleeping man in the forest. The song has a "surf" feel, cool guitar work, and pounding piano. Adams' comical vocal delivery is highlighted with loud snoring, sound effects, and a chorus of female singers. Adams was never reluctant to inject some levity into his work. "Rip Van Winkle" had followed on the heels of an earlier novelty song, "The Fun House," which was released on Nau-Voo Records in 1960. That song has remained a Halloween-time favorite. "Rip Van Winkle" has a history of resurfacing to tickle the fancy of Adams' fans, and nearly 45-years after the single was issued, it is still alive and well. Once in the 1970's, a disc jockey in New York City began playing the song on his radio show, and after a few spins the switchboard lit up with requests for the song. The disc jockey was convinced that he had a hit on his hands. He then made an all-out effort to find Adams, and after some time, he did locate him. Adams was flattered, but since he was in the ministry full-time, he was unable to capitalize on the opportunity. The recent "awakening" of Adams' music is appropriately timed, as Adams himself is in a period of new creativity. In the past year, his wife, Freda, was diagnosed with uterine cancer and after many grueling months of treatments, she was recently declared cancer-free. Obviously, that is a relief for Adams, as Freda is the light of his life. Inspired, Adams is making new music, contributing regularly to his "Billy Gram" section at the Rockabilly Hall of Fame�, and preparing to make major new announcements about his career. 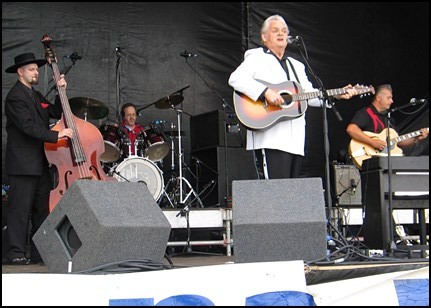 Billy Adams and his band, the New Rock-A-Teers, returned to England recently for two successful shows at the Americana International Festival in Newark, Nottinghamshire, on July 10 and 11, 2004. The festival, billed as an "American lifestyle" event, is one of the largest in Europe, and attracts people from all across the continent. Adams was one of the headliners in a stellar concert lineup that included Bill Wyman's Rhythm Kings (former bass player from the Rolling Stones), Albert Lee, Narvel Felts, and Dave Edmunds, among dozens of groups performing mostly American music. For Saturday's show (7/10), Adams and crew were in top form and he wowed the crowd with a program that he calls "Roots 2 Rockabilly and Beyond," a powerful musical mix of his own songs and some early influences that shaped his style. He opened with a rousing "Mystery Train," from the original "Hillbilly Cat" Elvis, followed by his own late 50's rockers "That's My Baby," and "You Heard Me Knocking." Adams then took the gathered fans down memory lane with short bits of real Americana music from Jimmie Rodgers and the Carter Family. Then it was time to kick it into high gear with a powerful combo of "That's All Right" and "Mama Don't Allow" where he produced what has now become his trademark showstopper, an amplified lard bucket lid, which he banged on with joy, raining the notes down in time with the music, which produced an effect somewhere between skiffle and the latest sample from a cool hip-hop artist. The crowed roared their approval. Next came a segment of American country classics, "Oh, Lonesome Me," "Pick Me Up on Your Way Down," and "The Smoke Comes Out My Chimney (Just the Same)," from the hillbilly master, Skeets McDonald. 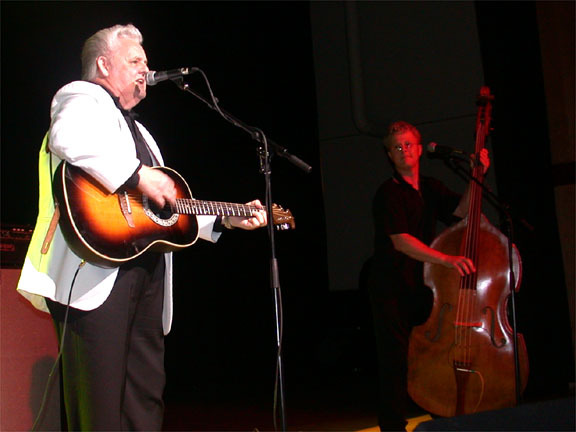 Adams proceeded with his own "You Gotta Have a Duck Tail," from 1959, which has become a "cult classic" in Europe, and it brought knowing cheers from the fans. These tunes were the perfect foil to what followed next, Adams' European debut of his world-class piano skills. Wasting no time, he fired up the ivories on Big Joe Turner's "Shake Rattle and Roll," and segued into the universal favorite, "Great Balls of Fire." While Adams pounded the piano, Dave Moore burned notes on the guitar, and drummer Clif Doyal and upright bassman Wayne Hopkins held fast like a well-oiled Cummins diesel engine roaring down the road. When the song spiked to an end, the whole audience erupted in applause. Switching back to guitar, Adams performed "Hey Jesus," an original gospel guitar-driven shuffle, then it was straight into Carl Perkin's "Matchbox," followed by Adams latest rock 'n' roll composition, "Hey Little Connie," which ended the set. As the announcer called Billy Adams' name to the masses, the entire gathering rose to their feet, and showed their desire for an encore. Adams and the band obliged, and gave the crowd what they wanted, the song that most of them came to hear, Adams' evergreen song from 1957, "Rock, Pretty Mama," which has been featured on dozens of record compilations released in Europe over the years. The bouncy hillbilly tune from the dawn of rock 'n' roll capped a perfect set.� After the show, Adams signed many autographs, visited with fans from many countries, and interviewed with a radio station from Liverpool. 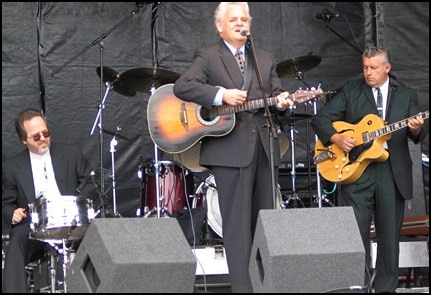 On Sunday, (7/11), Billy Adams and his band appeared dressed in suits and ties for his first gospel concert in England. The popular Sabbath morning slot at the festival has traditionally been held down by American entertainers, George Hamilton IV, and Paul Overstreet, but this year, it was Adams' turn. In a reverent and dignified show, Adams displayed the full breadth of his gospel music canon, gathered in over 35 years in the ministry. The set was mostly acoustic, and began with "I Saw the Light," "Mansion in the Sky," and "Rich in Jesus," after which he paused and welcomed the crowd warmly. He spoke about his late brother Charles, who had played lead guitar on all of his early songs, and sang a song written by him, "Shake the Nail-Scarred Hand of Jesus" (which was co-written and recorded by "Governor" Jimmie Davis). Then came a grouping of Adams' own compositions, culminating with "I Saw the Man," which was a Top-10 song in 1974 for the Happy Goodman Family. The chestnut "Supper Time" followed, wherein Adams injected a quiet recitation, while guitarist Dave Moore picked sweet notes in accompaniment, which brought a hush over the crowd. Now fully in control, Adams seized the moment with a mesmerizing solo rendition of "If I Could Help Somebody." With that, it fell so still over the festival grounds that you could've heard a pin drop. Then he told the crowd about how he had received the word to "go forth from the church and shine some light and sprinkle some salt," to spread His word. "And that is why I'm touring today," he stated. Switching to piano, with a full drum kit supporting him now, Adams pumped up the volume for an uptempo medley of religious favorites, which included "When I Lay My Burdens Down," and "Jesus on the Mainline," followed by a rollicking "Down by the Riverside." He closed the set with a very unique "lesson-in-song" called "The Piano Styles," where he played a sample selection of a song on the keyboards, and then showed how it was interpreted by different denominations and faiths, from Methodists to Baptists to Pentecostals. He explained how that in turn influenced many American recording artists, demonstrating what the refrain sounded like when executed by Fats Domino, Little Richard, and Jerry Lee Lewis. With each twist and turn of the same melody, the tempo increased, and finally Adams said: "And this is how a toe-headed boy from Appalachia played it (speaking of himself)." "Drummer give me about 100 miles an hour!" Then Adams' fingers sped along the piano keys lightning-fast to a clamoring crescendo, lifting the audience to their feet for a final standing ovation, which was a fitting close to an uplifting, spiritual concert in the English countryside. The annual Americana Festival weekend goes from strength to strength and is one of the most enjoyable occasions in the musical calendar. There is music to satisfy every taste. Significantly, however, there was a good deal more traditional country to be heard from the likes of Billy Adams than, say, Eve Selis, who fronted a rock band, a sure indication that one person's definition of Country Music may be considerably at odds with the next person's. Adams will be a new name to many, although rockabilly fans who enjoyed his British debut in October 2002 at Hemsby knew exactly what to expect. He's an imposing figure with a full head of white hair and gave an outstanding display of rockabilly and Country Music that included Mystery Train, an authentic rendition of Jimmie Rodgers' T For Texas and a beautiful instrumental of Wildwood Flower. Other highlights included Mama Don't Allow (on which Billy swopped his guitar for a lard bucket lid), You Gotta Have A Ducktail and Skeets McDonald's: The Smoke Comes Out My Chimney. Switching to piano, he rocked through Shake, Rattle And Roll and Hey Jesus, concluding with a brand new song, Hey Little Connie, and his most popular rocker, Rock Pretty Mama. Later, on the Sunday, Adams returned for his gospel show which proved to be just as exciting as his rockabilly set. Starting with I Saw The Light and Mansion In The Sky he then took his audience on a wonderful excursion through fine tunes such as Jimmie Davis's Supper Time and Tom T. Hall's Me And Jesus, plus a moving song, Rich In Jesus, written by his brother when he was near to death. Switching to piano for a rousing When I Lay My Burdens Down, Adams closed with an extraordinary sequence built around the song, Power In The Blood, which he commenced as a slow Baptist hymn before increasing the pace in the style of, first, the Methodists and then the Pentecostals and then adapting it to the differing styles of Moon Mullican, Fats Domino, Floyd Cramer and Jerry Lee Lewis, finishing off with a display of frenzied rock and roll piano pumping. Veteran rockabilly star Billy Adams, opened his Saturday after-noon set just as a storm had blown over, and for an hour Adams, whose reputation lured rockabilly fans to crowd the main stage area, paid handsome tribute to the likes of Jimmie Rodgers, Merle Travis, Skeets McDonald, Elvis, Don Gibson, Roy Orbison, Jerry Lee Lewis, Carl Perkins and others who had either influenced him or were his peers. It was a polished performance, which saw Adams switch from guitar to keyboards to delight the rockabilly fraternity and impress those who knew little about him until now. Sunday saw a turn for the better in the weather, and attracted a record crowd of day visitors. Billy Adams was given the task of hosting the traditional Gospel Show, which he did with flair. (Sunday) As usual the day's events started with the gospel show performed this year by Billy Adams who is a church minister. You don't have to be religious to enjoy this show as everything is performed in an entertaining manner. There are great tunes and some of the stories and anecdotes are very interesting to listen to. Two numbers I enjoyed were the very popular 'Suppertime' and 'If I can Help Somebody'. This was a great start to the day, and by the numbers gathered in front of the stage, it is very popular. 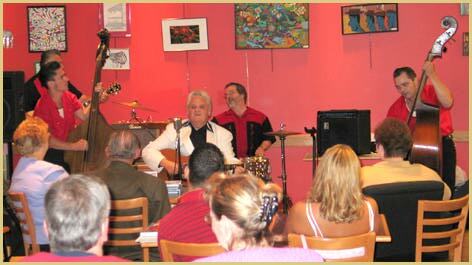 (Saturday) The stage was then commanded by Rockbilly Hall of Fame� member Billy Adams and his Rock-A-Teers. Billy started on local radio in Kentucky , aged 12 and formed his first band, The Rock & Roll Boys, aged 14, they toured successfully around Ohio. In '65 he joined the Ministry and combined his preaching with his music for 30 years, becoming an accomplished pianist. Today he's a rocker singing "Train Arrive", "That's My Baby", "T For Texas", "Momma Don't allow", in which he played a bucket tin-lid and a multiple of rock-a-billy songs, playing the piano "Jerry-Lee" style in some numbers finishing with his new "Hey Little Connie" and encoring with his 1955 hit "Rock Pretty Mama". A true pro. 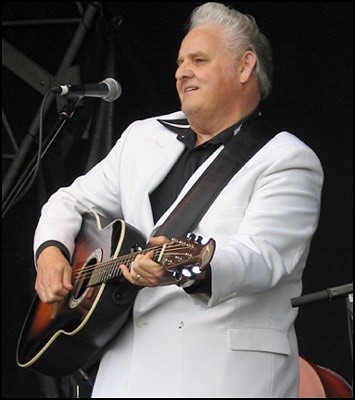 (Saturday) Old rocker (and preacher) Billy Adams gradually enthralled us with music from his youth, contemporary with Elvis and gave as a few songs in a rare authentic style. He drew his musical inspiration from hillbilly artists such as Jimmy Rodgers, the Carter Family and the bluegrass influence from Bill Monroe. True country at its best. Billy Adams returned to his old stomping grounds to perform a rockin' set in Huntington, West Virginia, on June 19, 2004. Huntington is very near the area where Billy grew up in Eastern Kentucky, and it was the first time that he has returned to play there in many years. A large crowd turned out at the Borders Books concert�to say hi to their old friend, and a lot of locals got to experience his musical magic for the first time. Billy then closed the set with a hard driving reprise of "Rock, Pretty Mama," and afterwards, he signed autographs for the crowd. During the next few days in the area, Billy, along with his manager, and his cousin Euless (who served as the tour guide), retraced the backroads and byways of his youth, seeking out old homeplaces, schools, churches, and cemeteries that were part of his early life, and are inspirations for many of his songs. And while Billy found that many of the actual buildings are gone now, the memories of those places rang out across the years to remind him of that young boy who beat on an old piece of metal and looked out over the tall trees and wondered if his music might take him to places far beyond these mountains. Later, as he reflected on his career of fifty years that has seen his music go all around the world, Billy agreed that the dreams of that young boy really had come true. Billy Adams Helps to Stir Up a Rockabilly Riot!! It is called by some: "a collection of the most essential rockabilly recordings by the greatest artists in the history of rock 'n' roll." Blender Magazine gave the album five stars and called it "The Greatest Rockabilly Compilation Ever." Roots-rocker Billy Adams says he's "just happy to be included" on the new Sanctuary/BMG Records compilation, Rockabilly Riot, set to be released on September 23rd. Adams certainly has every right to be happy, as his signature tune, "Rock, Pretty Mama" is featured on the collection, along with songs from major pioneers of rock 'n' roll, including Elvis, Jerry Lee Lewis, Roy Orbison, and others. This is only the latest chapter in the amazing story of a song that just refuses to go away. The Rockabilly Riot compilation will help to make sure that Billy Adams and "Rock, Pretty Mama" will be discovered by a whole new young audience, and he is thrilled. Musicologist Colin Escott sums it up best in the liner notes of Rockabilly Riot: "Billy Adams is now one of the great exponents of rockabilly from the golden era, in demand at clubs and festivals worldwide." "All of this from that one little song," Adams exclaims! Great Year for Roots-Rocker, Billy Adams. 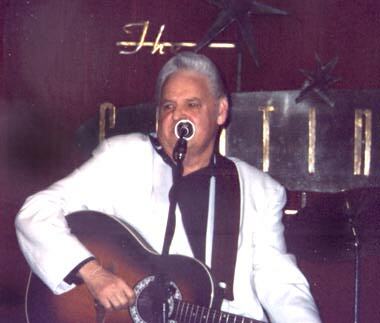 Billy Adams added to a great year of performances recently with a very successful show as one of the headliners at "The Rockabilly Rebel Weekend" in Indianapolis, on June 28, 2003. On a weekend bill that featured Big Sandy and many other great acts, Billy held court to a standing-room-only crowd at the beautiful Radio, Radio club on Saturday night. It was clear from the onset that this show was going to be one of the most well-received shows that he has had here in the U.S. The crowd of mostly 20 and 30-something fans were obviously there to see Billy. He didn't disappoint. Getting right to the point with "Mystery Train," Billy had the crowd from the get-go, before ripping through his new show, "Roots 2 Rockabilly and Beyond," which is a musical smorgasbord of tasty delights. Billy summed it up best: "Yes, I think that this was one of the best festivals that I have played since the rockin' '50s. I was absolutely amazed as fans from all ages and many places responded with such contagious excitement and great enthusiasm." Taking this show opportunity to debut his prowess on the piano (a lot of fans aren't aware that he is an incredible piano-pounder), Billy and the New Rock-A-Teers tore into "Shake Rattle and Roll" really getting the crowd rockin' with delight. Billy continued on with several more songs, before he ended the segment with the Jerry Lee rocker, "Great Balls of Fire" wherein the crowd squealed with delight, and showed their appreciation for this rare treat. Billy states: "I was influenced by the piano styles of many great artist of the early 50's, and that influence is very telling in my playing, yet today. The piano has been a part of my music since about 1959, and I plan to incorporate it in as many of my future performances as I can." When the show was over, Emcee Ken Motett took the stage and said, "You know, when you see some 'first-generation' rockers perform, you say 'you know, they did OK' well folks not tonight. Billy Adams rocked!" The eager crowd roared their approval, and they would not let Billy and the band leave the stage until he had done two encores! "It has been an awesome year for me, to say the least, and just to be privileged to be a part of so many great things, inspires me to take my daily peek above the clouds and say thanks. I will never forget the great events that I have shared with some of the most wonderful people in the world---my fans. But, the year's not over yet, and I have more surprises in store." Stay Tuned. Spring was in the air, and the live oak trees were loaded with thousands of cackling black grackle birds, as Billy Adams and the New Rock-A-Teers arrived in Austin, Texas, for the 2003 South by Southwest music conference and festival. Adams was included in the first wave of artists that were accepted to showcase for the four-day event, and he was one of over 1,000 acts who were selected to perform from the field of 6,400 artists that had submitted for consideration. Prior to the festival, the Austin press had spread the word; scouting reports on Austin360.com called Adams "a master of the genre," and the Austin Chronicle included him in their list of shows to catch, stating: "One listen to 'Rock, Pretty Mama,' the signature tune from his Rockin' Thru the Years, and you'll believe he's the real thing." Anticipation for the show was high, and Adams and the New Rock-A-Teers were in fine form when they performed at the Continental Club, on Friday, March 14. As showtime drew near at the Continental, fans and industry professionals began filtering in to the club on South Congress Avenue, which has been an Austin landmark since it first opened it's doors, in 1957. By the time Stuart Colman took the mic to introduce the dapper don of rockabilly, it was shaping up to be a full house of Billy Adams fans. Kicking off with the band on a rhythm-infused "Mystery Train," Adams quickly took command of the stage, and when the song was over, he reached into his own rockabilly grab bag and presented the song "That's My Baby" to an approving crowd, before capping the triple-threat of tunes with his now-classic Dot Records release, "You Heard Me Knocking." After the song ended, it was easy to tell that Adams was with an appreciative crowd - mixed with the loud applause, several fans in the club were chanting, "Billy, Billy," as their way of showing respect to the man-of-the-hour. Adams took this opportunity to welcome the fans, flashing his big, wide grin. He then invited them to join him in his latest musical fancy to take wings, "Roots 2 Rockabilly and Beyond," which is Adams' own personal musical odyssey, beginning with his earliest influences, progressing through highlights of his early rockabilly career, and finally, to the exciting new music that he is creating today. Adams then went straight to the "tap-root" with a solo rendition of Jimmie Rodgers' "T For Texas," which brought a cheer from the home state crowd, and without a pause, he was re-joined by Bobby Smith on upright bass, and guitarist, Dave Moore (this time on mandolin), for a snappy version of the Carter Family's "Wildwood Flower," which ended with drummer, Clif Doyal, spurring the excited crowd to clap along - which they did with gusto. Then, with an acoustic intro worthy of his R&B peers, Adams and the band kicked into a unique take on Jimmy Reed's, "Baby, What You Want Me To Do," that chugged along with a raw Texas-style shuffle, getting the attention of even the most jaded "industry-types" in attendance. Continuing this "history-lesson-in-song," Adams put the crowning touch on the "roots" segment by highlighting his assembled band on individual solos, with the song, "Mama Don't Allow." However, when it came to his turn, Adams put his acoustic guitar down, and told the crowd that "when me and my brother Charles were kids, we couldn't afford no store-bought instruments," and then he held up a shiny round disk, and banged out his solo by rapping his knuckles on what he called "the world's first amplified lard bucket lid." With that, the crowd went wild! Then, it was a quick snapshot of "That's Alright Mama," before Adams performed his signature song from the golden-age of rockabilly, "Rock, Pretty Mama." Switching guitars to move into the "Beyond" part of the show, it became clear that Adams songwriting talent far exceeds his rockabilly pedigree, as he pulled out the first of three new compositions that demonstrate the depth of his creativity. Leading the band with a swampy-sounding groove, Adams delivered the autobiographical, "Queen of the Three Room Shack," which brought bursts of applause from the crowd between every verse. Next came the drum-heavy, rhythm and blues flavored, "She's My Woman," before he and the New Rock-A-Teers closed the allotted 40 minute showcase set with an enthusiastic full-band rock 'n' roll shouter, entitled, "Hey, Little Connie." As the song ended, the crowd gave their loud approval, while Adams waved to them as he left the stage. With no time for an encore before the next scheduled act, Billy Adams left the happy crowd cheering and wanting more. Now, that's rock 'n' roll! "Billy Adams is the real deal ... . He's back and he's better than ever!!!" "...he's widely admired and respected by fans of vintage American music-especially in Europe." Pioneering rockabilly singer Billy Adams is back in circulation after a three-decade hiatus. By Ron Wynn, the Nashville Scene. 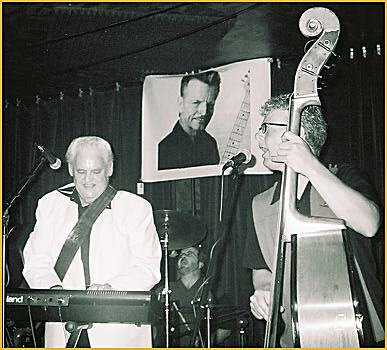 Feb., 2003 - Billy Adams is as energetic and committed to playing rockabilly today as he was back in the mid-1950s, when he started Billy Adams and The Rock & Roll Boys with his brother Charles and bass player Curtis May. Now living in Franklin, Adams has never enjoyed widespread fame like others from that period, but he's widely admired and respected by fans of vintage American music -- especially in Europe. A recent inductee to the Internet Rockabilly Hall of Fame, Adams and his band recorded numerous singles for the Quincy, Dot, Nau-Voo and Fern labels before he gave up rock 'n' roll to enter the ministry in 1965. All of those tracks, as well as unreleased material from the '50s and selections from Adams' 2000 album, Legacy, appear on Rocking Thru the Years 1955-2002, a career retrospective that testifies to his enduring body of work. Currently enjoying something of a renaissance, Adams will showcase tracks from his forthcoming album of new material with two performances this week. "I've loved singing ever since I heard Jimmie Rodgers and The Carter Family on the radio," says Adams, who was born in rural Redbush, Ky., in 1940. "We had an old radio powered by batteries in our house. The reception wasn't always that great, but I was immediately drawn to the way Jimmie Rodgers phrased his lyrics. He was a big influence; and the Western swing pianist Moon Mullican, he used to pound those keys, he was another major influence. And, of course, when I heard Elvis in 1954, that was kind of like validating what I was doing, because his songs were using that great beat. "It was an incredible time, a period when you could take all kinds of musical chances, and when no one really knew for sure what might or might not be a hit," Adams continues. "I think if we could have made it at Sun back then, we'd have had a shot at really being big." Shortly after releasing his first single, "Rock, Pretty Mama," for the Quincy label in 1957, Adams called Sun Records from a pay phone following a show in Springfield, Mo. ; he introduced himself as "Billy Adams from Kentucky, a 16-year-old boy with a record." Invited by "Cowboy" Jack Clement to come to Memphis and audition for Sun, Adams and his band nearly got there, but "our old Ford just couldn't make it." Adams sold the car for $50, canceled the rest of the tour and headed home. He finally reached Memphis in 1998, recording Legacy for Screen Door Records in 2000. What's always been most impressive about Adams' music is his pliable voice and fiery guitar playing. Pivotal singles like "You Heard Me Knocking" for Dot and the maniacal "You Gotta Have a Duck Tail" for Nau-Voo, both from 1958, feature his joyous, infectious vocals. "I've always thought it was important that the singer believe in what he's singing, and communicate that to the audience," says Adams. "We really loved making those records. The only problem I ever had was having to be on the road so much, and not having songs that I thought were good become as successful as possible because of politics or distribution. Back then, though, I didn't know that much about the business end [of music]." Although never one of the vaunted rockabilly acts of the 1950s, Adams still managed to attract national attention for early singles like "You Heard Me Knocking" and "True Love Will Come Your Way." Those records were issued on the Dot label, thanks to the efforts of Glen McKinney, owner and engineer of the Mack Recording Company, who offered Adams and his fledgling band a record deal. McKinney subsequently licensed those songs, which were recorded in his tiny Nau-Voo studios in West Portsmouth, Ohio, to Dot, the small but influential label that had been located in Gallatin until owner Randy Wood moved it to Hollywood in 1957. By the time Adams and his bandmates were putting out records on Dot, they were calling themselves The Rock-A-Teers. The combo toured extensively in 1958 and 1959, before Adams tired of the road and disbanded the group; he kept writing and recording, though, until 1965, when he totally shifted gears and took up a very different vocation. "I was called by the Lord, and it was time for me to do something completely different with my life," Adams says of his decision to enter the ministry. "I didn't even think about what it would mean to me commercially. I was concerned about what I could do to help others find the joy that I had discovered." However, he didn't completely turn his back on the past. "I found that a lot of times, people who'd heard those songs, or knew me from rockabilly or rock 'n' roll, would be fascinated hearing me talk about the Lord. Also, I felt my inspiration to perform and my talent came from God, so it just made sense for me to use everything on his behalf." Meanwhile, Adams' recordings remained in circulation; thanks to reissues of his early work by Ace, Bear Family and MCA, Adams and his music continued to enjoy a certain vogue, particularly overseas, where collectors are enamored of Americana of all stripes, notably rockabilly. The trouble was, several other rock 'n' roll singers named Billy Adams had surfaced in the interim, making it difficult at first for Adams to reestablish his identity as a performer. "One of them died in 1984, and some people thought that was me, especially since I'd been in the ministry and wasn't doing rockabilly or rock 'n' roll tours," Adams recalls. "I even had a guy come up to me at a show and ask me to sign a record that had my obituary printed on the back." Alive and quite well, Adams has since drawn rave reviews, especially for his concert appearances last summer and fall in England and for Rockin' Thru the Years, which has received high praise in a number of collectors' magazines. Not only that, his performance in Jackson, Tenn., at Rockabilly Fest 2001 was filmed and later aired on public television, attracting the attention of contemporary musicians like former Mavericks Robert Reynolds and Nick Kane. "There's a whole new generation out there who don't know about the old days, but are hungry to hear some real music," says Adams. "I'm real happy to get back out there and show them what the real thing sounds like." In what can best be described as a "media blitz," Billy Adams and the New Rock-A-Teers rolled into Hemsby, Norfolk, England, for his first European appearance, on October 4, 2002, at the "29th Hemsby Rock 'N' Roll Show." Visibility was high for the stalwart rockabilly steward, as it was the week of his highly-anticipated CD release on Sanctuary Records, Billy Adams Rockin' Thru The Years 1955-2002 (Castle Music CMRCD581). To amp up the spotlight, Adams was given "front-cover feature" treatment in Now Dig This magazine, who also reviewed his CD and the limited edition vinyl single which was released simultaneously, of his 1957 Quincy original track, "Rock, Pretty Mama" (CMN07581). Blue Suede News magazine ran a generous feature spread on the man, and even the Hemsby program booklet had a wild silhouette that was copied from a late-50's promotional picture of Adams. Full page ads for the retrospective CD release abounded in numerous publications, courtesy of his UK record label, and that, coupled with press and radio interviews, including the BBC, proved that Adams' arrival in the UK was eagerly anticipated, and they rolled out the red carpet for him like he was arriving royalty. Media hype aside though, after waiting for this moment for many years, Adams kept the focus on the music, and he came with his band from the U.S. all set to deliver the goods to what some critics have called "the toughest Rock 'n' Roll crowd on the planet," and deliver he did. That night, Adams started the show with what is becoming his signature opener, "Rockabilly Rock It" and instantly got the crowd on his side. Continuing right along, he rocked thru his repertoire of rockabilly sides, and brought an uproar of approval from the crowd when he nailed a rendition of his "Return of the All American Boy" from 1959. Continuing the musical journey through his recorded history, he called up sax and keyboard men to support sounds from his early 60's belter, "Darlin' Take My Hand" and the Antoine "Fats" Domino inspired, "Blue Eyed Ella." However, the real showstopper came when Adams brought out his legendary lard bucket lid and played it during "Mama Don't Allow," and the hard-pounding rhythms from the amplified lid drove the crowd into a wild frenzy. Just when the huge gathering thought that they had seen everything he possessed in his bag of tricks, Adams then introduced Wayne Hopkins, noted Hemsby perennial upright bass man, who joined Rock-A-Teers upright player Bobby Smith, in a recreation of Adams double attack 50's line-up of two basses playing at once (historians say that he was the only band of the era to perform that way). In fast succession, he poured out his 1998 Sun session Legacy cuts, "Rockabilly Special," and the edgy "Hey Jesus" before closing out the set like the roar of a bass 'n' drum-driven freight train, on his previously unheard song, "Hot Dog, I'm A Real Cool Cat." Then Adams waved, and left the stage. But it was only momentarily, as the crowd screamed for more, until he and the band came back for two encores, "True Love Will Come Your Way," from his 1958 Dot Records release, and he closed the show with the one that they had all been waiting for ... the big-bang that started Adams' career, his first record, "Rock, Pretty Mama." After the show, Adams was joined backstage by many well-wishers, including Hemsby promoter, Willie Jeffery who was heard congratulating him with the words: "That show was brilliant man ... .spot-on perfect!!!" Jack Earls, a Sun-era artist who was also on the festival, yelled out to Adams, "Man, you better keep your bags packed ... you'll be coming back to Europe soon." Other luminaries, including Sam Szczepanski, of Sanctuary Records (who came from London to attend the show), posed for pictures with the man-of-the-hour and his band, and gave kudos all around. Cameras flashed as Adams was quickly ushered into a several hour autograph session with a waiting line of fans, and he stayed until the last person was greeted. Pretty heady stuff for his first appearance outside of the USA, but he came prepared, and he surely put to rest any rumors that he was dead ... for good. No proper dead man rocks like Billy Adams! Sanctuary Records is set to release Billy Adams-Rockin' Thru The Years 1955-2000 (Castle Music CMRCD581) and a limited-edition vinyl single (CMN07581), on October 7, 2002. The 27-track career retrospective marks the first time that all of the early recordings of this Kentucky-born rockabilly and rock 'n' roll legend have been gathered on one album. The pre-release for the record will coincide with Adams' first European headliner performance on October 4, at the 29th Hemsby Rock 'n' Roll Weekender, in Norfolk, England - one of the top rockabilly festivals in the world. The compilation was produced by Nashville talent manager Clif Doyal, with assistance from Adams himself, who also currently resides in Nashville, and it is the first release to be licensed from their joint-venture label imprint, Redbush Classics Records. The Sanctuary CD features liner notes by top rock 'n' roll authorities, Stuart Colman and Tony Wilkinson, and includes a 16-page booklet with many historic label shots, photographs, and period reviews from Billboard Magazine. All of Adams' original recordings for Quincy, Dot, Nau-Voo and Fern Records are featured here, including many that have not been re-issued since they were first debuted. The digitally re-mastered collection also includes historic unreleased tracks, "living room" recordings from the late 50's, selections from his 1998 CD, Legacy (recorded at Sun Studio), and recent live recordings from a 2001 performance at Billy Block's Western Beat radio show, in Nashville. The release is being supported by press ads, and numerous magazine and radio features, both in the U.S. and Europe. 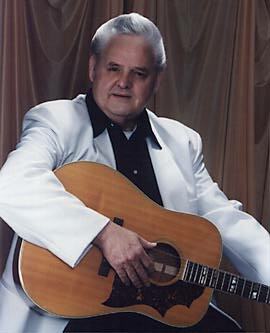 Rockabilly Hall of Famer, Billy Adams, began his career with the landmark song, "Rock, Pretty Mama," released on Quincy Records, in 1957 (the new Sanctuary vinyl single is a re-issue of this sought-after recording, together with a previously unreleased track from his Sun sessions). The original 45 rpm record of "Rock, Pretty Mama" is now valued between $1,500-$2,000 in The Official Price Guide to Records: 2002. Adams followed this with a string of releases including, "You Heard Me Knocking" for Dot Records, the teen anthem, "You Gotta Have A Duck Tail" and "Return of the All American Boy" for the legendary Nau-Voo label, and "Darling Take My Hand" for Fern Records, among others (many of these original records are housed in the collection at the Country Music Hall of Fame). 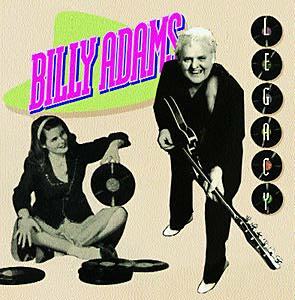 Those seminal recordings have cemented Billy Adams' status as one of the originators of the rockabilly sound, and they have been included on over 20 compilation releases on MCA, Ace, Bear Family, Collector, and other labels worldwide, for the past 25 years. While those releases have helped to maintain the visibility of this influential artist, Billy Adams-Rockin' Thru The Years 1955-2002 is a complete career retrospective that spans Adams' nearly 50-year career (until recently many people thought him to be dead), and fills in the gaps of this musical survivor's recording history. Sanctuary's release of Billy Adams-Rockin' Thru The Years 1955-2002 will further develop a major revival of interest in Billy Adams' career in Europe, and the US. (Nashville) Billy Adams and his new Rock-A-Teers band rocked the crowd at the "Rockin' 50's Fest" at the Oneida Casino, in Green Bay, Wisconsin, on July 11, 2002. Adams was featured at the week-long "Rockin' 50's Fest," along with the largest grouping of rockabilly superstars ever gathered for one single event, including The Crickets, Janis Martin, "Big Al" Downing, Dale Hawkins, Sonny Burgess and The Comets, among many other talents. In all, over a hundred acts graced the stages at the Oneida Casino for this once-in-a-lifetime "Super Bowl" of rockabilly music. Four days into the event, Billy Adams had a group of eager fans from around the world waiting when he stepped on stage at the 3 Clans Stage Ballroom, and he did not disappoint them. Adams opened the set with a Chuck Berryish styled mover, called "Rockabilly, Rock It," then he segued into some of his classic rockabilly hits from the 50's, including "That's My Baby," "You Gotta Have A Duck Tail," and "True Love Will Come Your Way," pausing only momentarily when he broke a string on his guitar (since he had originally learned to beat out rhythms on a lard bucket lid, he does tend to punish his guitar strings!). Taking this opportunity, Adams introduced his friend, fellow rocker Larry Donn, who joined the band on piano for a spirited version of Bill Haley's "Shake, Rattle and Roll." Adams then dipped deep into his recorded history and dusted of his 1960 Nau-Voo Records doo-wop inspired ballad, "Blue Eyed Ella," and capped the mid-set with his own version of the rollicking "Matchbox," taking full advantage of Larry Donn's keyboard savvy. The happy crowd was pleased, when the opening strains of Rock-A-Teer Dave Moore's guitar heralded the arrival of one of the most requested songs in Adams' repertoire, the thunderous "You Heard Me Knocking," from his first nationally distributed single on Dot Records, in 1958. When the song finished, and the clapping subsided, Adams recalled to the gathered mass the dreams of a 15 year-old boy from Appalachia that were realized when he recorded his first ever song in 1955, the now-classic, and much sought-after Quincy Records single, "Rock, Pretty Mama." The fans pressed forward to take in the elixir of the song that has become Adams' calling card around the world, the song that was birthed near the dawn of the advent of rock 'n' roll, the same song that many in the crowd had heard on dozens of compilations released around the world for years ... .and now it was delivered in the flesh, by the man now far removed from that scared young boy, with a voice that has only grown stronger with age. When the song ended, the fans cheered, and with great fanfare, the Rock-A-Teers vamped as Adams waved to the audience and left the stage. Not satisfied, the audience wanted more. Mouse, the M.C., invited Adams and the Rock-A-Teers back for an encore. 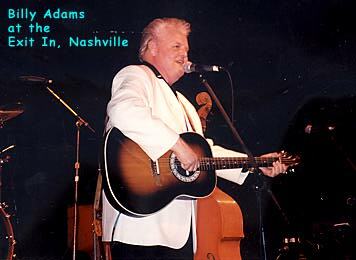 Adams and band came back and closed the show with his own musical re-telling of the history of rockabilly in "Rockabilly Special," which he had recorded in 1998, at the legendary Sun Studio, in Memphis, Tennessee. After the performance, fans from over 15 countries crowded to Billy Adams' autograph line to greet their idol. He was particularly taken by one young Japanese fan who spoke very rapidly in his native tongue, ending excitedly with the only words that both men had understood: "Beelly Adams!!! Rock, Pretty Mama!!!" That said it all. "Rockabilly Fest 2002" -Jackson, TN. in August. "Hemsby 29" - Hemsby, England, in October. His first European appearance. A newly reformed "Rock-A-Teers" rocks behind Billy! Recent performance at "Billy Block's Western Beat" show, in Nashville (his third appearance there). An all new album is in pre-production with noted producer, Stuart Colman (Shakin' Stevens, Don Walser, The Crickets, Nanci Griffith, Little Richard). 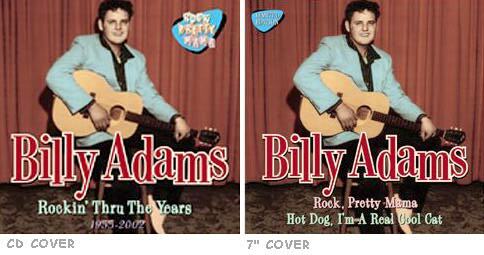 "Billy Adams-Rockin' Through The Years." New career retrospective CD compilation now available for licensing. For the first time, all of his classic hit recordings from the '50s, and '60s. Plus unreleased "living room" demos from the '50s, recent studio and live recordings...and more!!! 26 digitally re-mastered recordings, plus vintage photos, record label shots, and historical reviews. Marking the first time that all of his early recordings have been available in one collection. New and Recent Press:>br> Album reviews, show reviews, and feature-length stories in many international music magazines, including, American Music (Sweden, June & December 2001), Now Dig This (UK, June & December 2001), and Rockin' 50s (US Oct./Nov. 2001). Recent write-ups in "The Punmaster," "CelebrityAccess," and "Blackcat Rockabilly" all Internet music industry newswires. 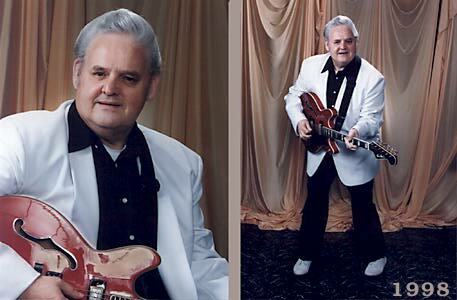 Internet Rockabilly Hall of Fame Member. His early records are housed in the collection of the Country Music Hall of Fame. His original music has been featured on over 20 compilation albums released worldwide from 1977-2001 on MCA, Ace and Bear Family Records, among others. Always a "Hot New Fact": Billy Adams ... Keeps-A-Rockin'! 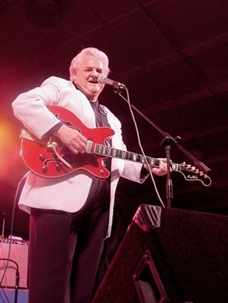 Rockabilly stalwart Billy Adams was one of many luminaries on hand this year at the "Rockabilly Fest 2001", held in Jackson, TN, June 28-July 1. The 3 day concert event was filmed for later broadcast on PBS. Billy Adams recorded in the 1950's and 60's for Quincy, Dot, and the Nau-Voo record labels. His material is now widely available on compilations released by MCA Records, Bear Family, and other labels. Billy attended the "pre-festivities" artist reception the night before the event, along with many other pioneers of the genre, including: Bill Haley's Original Comets, Sonny Burgess, W.S. Holland(drummer for Carl Perkins and Johnny Cash), D.J. Fontana (Elvis Presley's drummer), Big Al Downing, Mack Self, "Smoochy" Smith, Paul Burlison, and many others. There were also many young Rockabilly talents in the audience from all across the U.S. and Europe. After a rousing set by Stan Perkins (son of Jackson's Carl Perkins), Billy Adams was introduced. Billy spoke of his early career, and performed a lively rendition of "Mama Don't Allow", backed by W.S. Holland and Dave Crimmen on guitar. A good time was had by all in attendance. On Friday night, Billy greeted many fans, reminisced with fellow artists, and took in one of his favorite performances, as The Comets rocked the house. On Saturday, Billy was present for the opening tour. Henry Harrison, who is the founder and promoter of the event, along with W.S. Holland, led the first official tour of the facility. During the walk-through, Mr. Harrison paused, and introduced Billy to the gathered crowd as, "one of the greatest recording artists of the Rockabilly era". Afterward, there was a luncheon at The Carl Perkins Civic Center, which was hosted by Ms. Maria Elena Holly (widow of Buddy Holly), Billy Burnette, and featured speaker, the legendary founder of Sun Records, Mr. Sam Phillips. Later that day, Billy watched while his drummer Clif Doyal participated in an attempt at the world record for the most drummers playing full drumsets at one time, on one song. Stan Perkins led 52 drummers and an all-star backing band through his father, Carl Perkins, version of "Blue Suede Shoes". 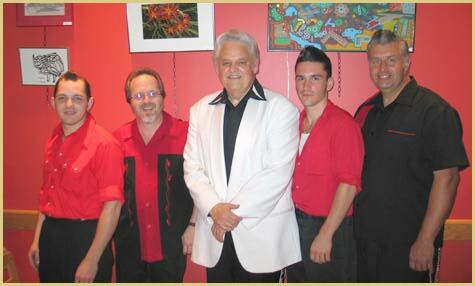 On Sunday, Billy Adams and his band "The Rock-A-Teers", performed a rousing set for the concert series. Billy greeted the crowd, and announced that his management had just received word that he has been invited to perform at one of Europe's most celebrated festivals, The Hemsby in 2002. Billy kicked of his set with a rockin' cover of "C.C. Rider", and proceeded on with a high-energy show that included several of his Rockabilly hits from the 1950's, including: "You Heard Me Knocking", "You Gotta Have A Ducktail", and "That's My Baby". He also demonstrated his guitar prowess as he and backing musicians, Dave Moore, Mike Vencill, and Clif Doyal ripped through a nine song playlist. Midway through the set Billy paused, and dedicated "I Can't Stop Loving You" to his wife Freda, who was in attendance, in honor of their fortieth wedding anniversary. Billy closed his set with his first, and most influential recording, "Rock Pretty Mama", which was released on Quincy Records, in 1956. The set was received by raucous applause by the crowd. Many luminaries of the press and Rockabilly business world were on hand, including Bill Griggs of "The Rockin' 50s" magazine, who is preparing a feature story on "Rock Pretty Mama". (the original 45 record is a much-sought-after collectors item around the world). Following the performance, Billy was seen talking with noted German promoter, Klaus Kettner, who has committed to tie-in dates with Billy's planned tour of Europe in 2002. Billy closed out the day greeting his fans and signing autographs at the booth of Billy Poore, noted Rockabilly historian, and author of "Rockabilly: A 40 Year History". April, 2000 - With Robert Reynolds (The Mavericks). Tuesday, September 7, 1999, at the Exit/In on Elliston Place in Nashville, Tennessee, was definitely THE place to be as many of Nashville's most talented musicians, writers and performers took the stage during Billy Block's Western Roots Revival, to celebrate what would have been Buddy Holly's 63rd birthday, a show coordinated by Robert Reynolds of the Mavericks. Billy Adams rocked with one Buddy Holly song, and two of his originals, "Rock, Pretty Mama" and "You Heard Me Knocking". Billy brought the audience to their feet for two standing ovations. The applause and shouts for "more, more, more," was overwhelming, particularly since it was Billy's first performance in Nashville, and his first rockabilly performance in forty years. The entire show was broadcast live over the Internet, and can be viewed on Western Beat Roots Revival at LiveOnTheNet.com. The words "awesome" and "fantastic" were repeated more times that night to describe Billy's performance than one can possibly count. People rushed forward to shake his hand, congratulate him and speak with him. One of the evening's greatest compliments came from Robert Reynolds of The Mavericks who performed and hosted the tribute. His comment captured the performance in one sentence; "Billy, in every show there is a high point. Tonight, Billy, you are that high point." 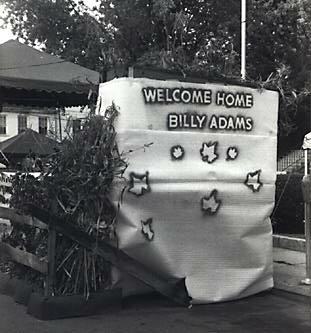 Billy Adams was born March 6, 1940, in Redbush, a tiny hamlet in Johnson County, Kentucky. Billy's father worked as a coal miner in the Van Lear coal mine (the same one mentioned in Loretta Lynn's "Coal Miner's Daughter"). His mother kept the house, and cared for 14 children. Money was scarce, and food was often in short supply for the family. It was in those extreme, hard times that Billy's interest in music and writing began to surface, and he began to dream dreams that were far greater than the poverty that shackled his family to the Appalachian hills. Billy was influenced by hillbilly artists such as Bill Monroe, the blue yodeler Jimmie Rodgers, the Carter Family, Merle Travis, and Moon Mullican, with songs and sounds that came into the house from an old battery operated radio. On Saturday nights, the broadcast from the Grand Ole Opry sparked images of strange and fanciful places in young Billy's mind. He recalls, "I vividly remember many times looking up over the tall slender pine whose tiny green needles seemed to pierce the blue-green sky, and dreaming of the day when I would play my very own guitar - like the singers that I heard on the radio - and it would take me to places far over the hills." Sadly, the reality was that Billy's family could not afford to buy real musical instruments, so he and his older brother Charles found other ways to express their music. They could often be heard singing at the top of their voices, and accompanying themselves by pounding hard, driving rhythms on lard bucket lids. This rhythm would require both skin and blood, and would later prove to be a very prominent force in Billy's music. The family moved many times in search of work after Billy's father developed lung trouble from working in the mines. After one move to Greenup County, Kentucky, his father was able to borrow a Harmony Monterey guitar from a kind neighbor, and he taught his sons to play the simple chords that he knew. Billy's dream was starting to take shape. Billy's lonesome, rebellious voice was first heard on radio in 1952, at WCMI in Ashland, Kentucky. During that performance, it just came natural for the 12 year-old to pound out the same rhythm on the guitar that he had created on the lard bucket lid. The crowd loved it. In early 1954, Billy heard Elvis Presley for the first time on the radio, and he heard in Elvis' music the same driving rhythm style. That was his cue. Billy organized his first band, and called them The Rock & Roll Boys. 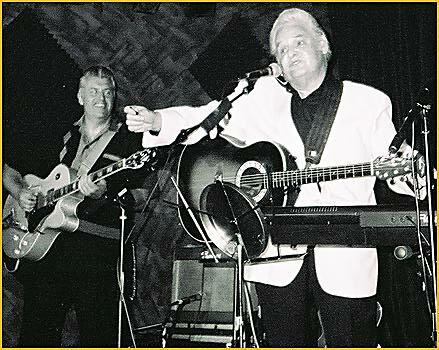 With Billy on the pounding acoustic rhythm guitar, his brother Charles, on the electric lead guitar, and Curtis May on the upright bass, it was a three-piece band, just like Elvis had. The die was cast. Around this time, Billy had written a song that he believed in strongly. So did others, including a local entertainer named Luke Gordon. Gordon encouraged Billy to record the song, and so Billy and the band traveled to Cincinnati, Ohio and recorded "Rock, Pretty Mama" in the fall of 1955. Gordon later released the single on his own Quincy Records, in 1957. The band soon found themselves in demand, and began touring throughout the Midwest. 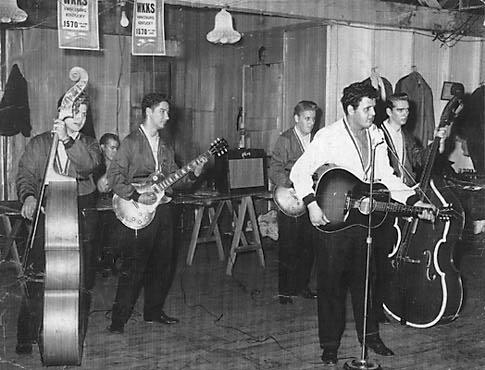 At one point, hoping to take the next step up the ladder of success, Billy stopped at a pay phone in Springfield, Missouri, and made a call to Sun Records in Memphis, Tennessee. After introducing himself as "Billy Adams from Kentucky, a sixteen year-old boy with a record," he received an invitation to come to Memphis. But, fate intervened, and right after the call, his '49 Ford broke down. With no money to repair it, he sold it for fifty dollars, and he the band beat a hasty retreat back home on a bus. Little did he know that the trip to Memphis would not happen for many years to come. In 1965, Billy Adams received his calling into the ministry, and he began evangelizing to audiences across the U.S. and abroad. He also expanded his musical skills, becoming a consummate piano player, combining preaching with music, to help him spread the message. It also was a watershed time of creativity for him as a writer of gospel and country music (his complete discography is 6 pages long). Charles Adams, Randall McKinney, Billy Adams, Curtis May. By the late 1980's, Billy Adams' classic songs began to be resurface on MCA, Ace, Bear Family, and other record labels worldwide, spurring a renewed interest in his music. Unfortunately, another recording artist named Billy Adams (who ironically had recorded for Sun Records), had died in 1984, and many people confused him with that man. Surprised by the revival of his music, and undaunted by the news of his "early demise," Billy was motivated to realize his long-held dream. In 1998, he entered the legendary Sun Studios in Memphis, and announced, "I am Billy Adams from Kentucky, and although it took me 41 years to get here, here I am!" The resulting session was released on CD as Legacy, in 2000. The album won rave reviews from many critics. It proved to be a powerful comeback vehicle for him. 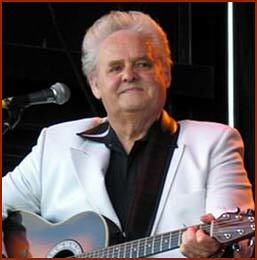 Shortly thereafter, he was inducted into the Rockabilly Hall of Fame as a "Legends" member. With his career revitalized, Billy is enjoying performing again, touring with a group of musicians that make up the new Rock-A-Teers band. In October of 2002, he played for the first time in Europe, at "The 29th Hemsby Rock 'N' Roll Show," in England, one of the continent's pre-eminent roots-rock festivals. That appearance coincided with the issue of a 27 track career retrospective, entitled Billy Adams-Rockin' Thru The Years 1955-2002, released on Sanctuary (Castle) Records. The project spans Billy's rockin' career from the '50s thru today. Noted music impresario Billy Block has made Billy a regular on his famous "Western Beat Roots Revival" radio show in Nashville. That has helped to gain him support from some elite fellow musicians, including Robert Reynolds, Nick Cain (the Mavericks), and Bill Lloyd, among others. Billy's concert schedule continues to grow, with recent shows in Las Vegas, Green Bay, Indianapolis, and SXSW 2003, in Austin, among others. In July of 2004, Billy and his band were featured headliners at the Americana International Festival, in Newark, Nottinghamshire, England, along with stellar performers including Bill Wyman's Rhythm Kings (former Rolling Stones bass player), Albert Lee, Dave Edmunds and others. As a testament to the staying power of a great song, Sanctuary/BMG Records included "Rock, Pretty Mama" on a compilation entitled Rockabilly Riot (released in September of 2003), along with tracks by Elvis, Roy Orbison, Jerry Lee Lewis, Carl Perkins and others. As a fitting jewel in his comeback crown, the song that first launched his career once again brings Billy Adams' unique brand of American roots music to a whole new generation of fans, and adds to his ever-expanding fanbase and touring schedule. Musicologist Colin Escott sums it up best in the liner notes of Rockabilly Riot: "He is now one of the great exponents of rockabilly from the golden era, in demand at clubs and festivals worldwide." 2007 marks Billy's 50th anniversary as a recording artist, beginning with the 1957 release of "Rock, Pretty Mama." It is an exciting and busy time for him. He plans to unveil new recordings, and scores of interviews and features are planned, including a feature interview in the Public Radio International Rockabilly documentary series, Whole Lotta Shakin'. And he recently returned for two well-received shows at the 2007 Americana International Festival, in England. Fifty years on, Billy Adams is still "Rockin'!" LEFT: Billy holding two of his early records that are on display. RIGHT: Billy chats with a CM HoF employee on this 1997 visit. 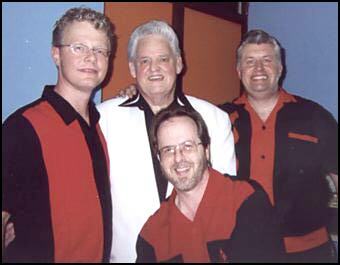 L. to R: Curtis May, Dave Thornhill, Charles Adams, Billy Adams, John Thornhill. (contains "You Gotta' Have A Duck Tail", "That's My Baby"
and "Return Of The All American Boy", + other artists). "You Heard Me Knocking" + other artists). "Return Of The All American Boy" + other artists). Dale Hawkins, and Sanford Clark). (contains alternate version of "Rock, Pretty Mama". Brenda Lee, Johnny Carroll, Johnny Burnette and Buddy Holly). (contains "You Heard Me Knocking" + other artists). Winkle", "That's My Baby", and "Return Of The All American Boy"). the intro edited, + other artists). (contains "Rock, Pretty Mama" + other artists). (contains "You Gotta Have A Duck Tail" + other artists). (contains "Return of the All American Boy" + other artists). (contains "You Heard Me Knocking", + other artists). (re-issue of Spin Records 1000). (contains alternate version of "Rock, Pretty Mama" + other artists). (contains original version of "Rock, Pretty Mama"+ other artists). (contains 1998 version of "Rock, Pretty Mama", + other artists). contains re-recordings of four of his '50s rockabilly hits). Siblings: 8 sharing the same parents: Charlie, Dorothy, Lillian, Susie, Faye, Kaye, Elna, and Dianne Adams and 4 "step-siblings" : Wayne, Darcus, Opal, and Dixie Adams. Wife: Freda Louise Riffe. Their wedding took place in a little church on Argillite Road, in Flatwoods, KY. The minister was E.L. Cyrus, the late grandfather of country music's Billy Ray Cyrus. Children: Tina Maria, Teresa (Reesee), and Janetta Darlene. The girls formed a trio in the early 90's, "Mountain Harmony". 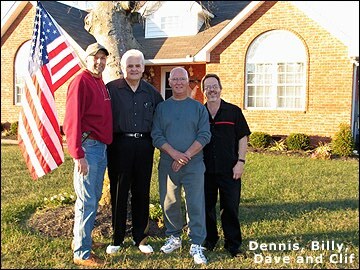 For four years, Mountain Harmony performed and recorded Christian country music. They opened for many great country artists and enjoyed a two year stint at the world famous "Renfro Valley", Kentucky's own little Grand Ole Opry. Favorite Pet: His Siberian Husky "Keeno The King" born Dec. '97. Favorite Hairstyle: The Ducktail, of course. Billy was honored with many awards and plaques from the Greenup, KY Lion's Club and the local merchants. He was also accepted into the prestigious Kentucky Colonels by Governor John Y. Brown.